Silly, huh? It should be common sense, but it kind of isn't if you weren't raised on records. 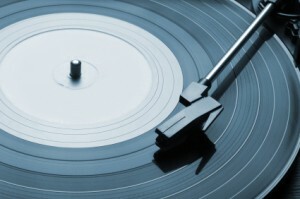 In most cases, you just plop the record down on the turntable, turn it on, and the record will play automatically. In some cases, you may need to actually place the needle on the record after starting the turntable. Do it gentle, and you'll be fine. Other things to make sure about are the speed of the record. If you're playing a big 12" record, it will probably be a 33RPM record, although there are some exceptions. If it's a small, 7" record, it probably plays at 45RPM. Those small 45's also usually require a piece of plastic (sometimes called a spider) in the center of the record, so the spindle on the turntable holds the record properly. I did a much more detailed post about maintaining vinyl records, but basically, you just need to treat your records with care. Don't expose them to anything nasty and you should be fine. Store them upright. Keep them out of sunlight. Try to keep them at a decent temperature. That's really all you need to know. Records, unlike digital music formats, are pretty high maintenance. They get dusty, they can't handle heat, they are prone to static cling...The list goes on. The most important thing is to keep records clean. A big part of keeping them clean is taking precaution. Try to handle them by the edges, and only with clean hands. Give them a quick wipe with a carbon fiber brush before you play and before you put the record away. If they get gunky, oily, etc, you'll want to do a more thorough (wet) cleaning. Here's a detailed post about cleaning vinyl records. Ultimately, vinyl records are about the music. I know there are some audio snobs and old hippies that like to get all high and mighty about the sound (and digital audio enthusiasts who say digital is better), but the truth is it doesn't matter. I want my music to sound the best it can, but I also just want to hear music, regardless of the format. If you're just getting started in vinyl records, follow your heart. If you like how it sounds, the experience, and everything else that goes with it, then it's all good! excellent! thank you! I am just starting into getting into vinyls… I am clueless about all the good music. And how I regret it! I am looking into buying record players, vinyls, and even working at a Record store locally! Thank you.. I surely will look into the 50’s – 80’s. I need some advice, Alan. Should I go to thrift stores/garage sales to find a antique of a record player? Or order a brand new one online? Oh yes, what is the difference between turntable and record player? And what is a phono input or anything related to phono?.. You can certainly find plenty of record players in thrift stores and at garage sales, but you never know what shape they’re in. Unless you can’t afford a new record player, I’d buy a new one. Turntables and record players are the same thing. Geeks tend to prefer the term ‘turntable’, but it doesn’t really matter. The phono input is specifically for turntables (aka PHONOgraph). It has a pre-amp, which amplifies the signal coming from the record, and also provides equalization for the ‘RIAA curve’. Don’t worry about the specifics, just be sure you plug your turntable into the phono input. Great info BUT I own a “Spin Clean” record washer and found that it does a really great job for under $100 USD. It is a little time consuming but I have cleaned over 400 records with it so far and have no complaints. It will clean any size vinyl record you may have. Just give yourself some space to work and a few hours a day and you can do your whole collection and know that they are all clean and ready to play or sell.